If you have ever had a general anaesthetic, you may be familiar with the feeling of losing consciousness: You start to fall asleep, and you lose wakefulness, but you also start to lose awareness — awareness of where you are, who you are, what is going on around you and the predicament you are in. There are two different components of consciousness: wakefulness and awareness. Our research deals with questions such as: What if someone is aware, but cannot respond? Or what if they can, in fact, respond to a command, just not in a way we can easily detect? What is vegetative/minimally conscious state? Our research is primarily focused on patients who have been diagnosed as being in a Vegetative State (VS) or a Minimally Conscious State (MCS). Vegetative state is commonly defined as ‘wakefulness without awareness’. Patients with a vegetative state diagnosis may appear to be awake, but will show no evidence of self awareness, awareness of others, or awareness of the environment. These patients have preserved brain function that allows them to breath on their own and maintain sleep and wake cycles. However, regions of the brain responsible for language comprehension and expression, or sustained, reproducible, purposeful and voluntary responses to external stimuli, have been damaged. Minimally Conscious State. Like vegetative patients, minimally conscious patients also have sleep/wake cycles and preserved brain function that allows unassisted breathing. These patients differ, however, in their ability to show reproducible behaviour indicative of some level of self awareness, and awareness of the environment, albeit inconsistently. In short, there is sufficiently preserved brain function for the patient to reliably show that he/she has some level of awareness, but not enough preserved function for the patient to communicated reliably. Locked in syndrome patients are both awake and aware, thus they are fully conscious. However, due to complete paralysis of almost all voluntary muscles, these patients are unable to move. Communication is usually restricted to eye blinks and/or eye movements. Vegetative state, minimally conscious state and Locked-in state are described in more detail in the Annals of the New York Academy of Sciences 2009. Magnetic Resonance Imaging (MRI) is a powerful non-invasive imaging technique that generates high quality images of the brain, and different body parts, without harming the patient. A powerful magnetic field generated by the scanner allows us to obtain images of the brain in different planes and generate three-dimensional reconstructions. MRI does not use radiation and we do not use contrast agents in our research. Functional MRI (fMRI) is a technique that allows us to monitor brain activity through the blood oxygenation level-dependant (BOLD) signal. This technique is used to observe, in a non-invasive fashion, changes in the brain’s blood flow in response to various kinds of stimulation (e.g. visual stimulation, auditory stimulation). 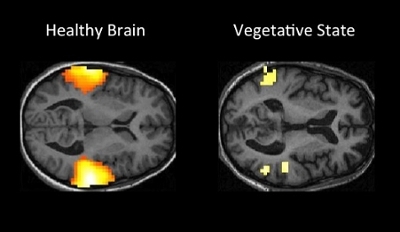 The areas activated in the brain during an fMRI examination will need more oxygen and thus draw more oxygen-rich blood to that part of the brain, which appears, in our data, as red/yellow ‘blobs’. Diffusion tensor imaging (DTI) is an MRI technique that measures the activity of water molecules as they move through brain tissue. This technique provides information about the molecular environment and microscopic structure of the brain. We use this information to study the structural integrity of the brain, and whether certain networks within the brain, which are responsible for consciousness, have been damaged as a result of brain injury. (Annals of Neurology 2012). What type of responses do you use to measure awareness? We study both automatic and non-automatic responses. Over the years we have studied different aspects of brain function, including automatic responses such as vision (Human Brain Mapping 2012), hearing (Neuropsychological Rehabilitation 2005), speech perception (Brain Injury 2008), and comprehension (Brain 2009); as well as non-automatic responses such as the ability to follow verbal commands (Science 2006, Neurology 2012, PLOS One 2012) and communication (New England Journal of Medicine 2010). There are many different processes in the brain that are fully automatic. Facial recognition is one of them. For example, you cannot decide not to recognize somebody you know. If a familiar person’s face appears in front of you, your brain will automatically respond to it. You cannot make the choice not to recognize it, because it is an automatic brain response. Understanding language is another example. No matter how hard you try, you are not able to not understand what you are hearing if you listen to speech in your native language—it is processed by your brain, whether you like it or not. These types of automatic brain processes have been shown to occur in healthy individuals even when they have been heavily sedated with drugs (PNAS 2007). If you give an individual a light anaesthetic and play a recording of speech, their brain will still respond to the stimuli as though they were aware, even though the individual will later report being unaware of the recording. For this reason we know that responses to stimuli like speech and faces in patients who appear to be vegetative are not necessarily signs that they are aware – they may simply be automatic responses that occur in the absence of awareness, just as they do in healthy participants who have been sedated. While many of our brain functions occur automatically, we do have control over some aspects of brain function, including our ability to physically move our body or imagine certain activities. For example, we can decide to imagine playing a game of tennis if somebody asks us to do so. Even if we were asked to imagine playing tennis, we can freely decide to imaging a game of chess instead, or perhaps nothing at all. Similarly, if someone was asked to raise their arm, they could choose to follow the instruction or choose to ignore it. In this sense, engaging in these activities is not an automatic brain response. Rather, it is a decision that we make and we have conscious control over what that decision is. Because choosing to move our body or imagine activities when instructed to do so requires a decision on our part, it is safe to say we must be aware, and therefore conscious, to make such a decision. If we were unaware, and therefore unconscious of these instructions, it would be very hard, if not impossible, to explain how it is that we can engage in consistent and predictable behaviour – whether raising an arm or imagining an activity—in response to commands to do so. It is this type of intentional, non-automatic brain response that we believe is indicative of awareness. Finding this type of brain response in patients who are otherwise unable to follow commands through visible behaviour is our primary interest. Who can participate in your study? For more information on becoming a participant please see the “To Get Involved” section. We aim to gain a better understanding of residual brain function in people who have impaired consciousness after sustaining a severe brain injury. Residual brain function means a patient’s ability to process language, visual information, or other stimuli. We seek to get a better understanding of the different degrees of consciousness by probing the presence of self-awareness, awareness of others, or awareness of the environment. We also aim to understand the specific brain damage that is causing the loss of consciousness in these patients. Unlike other neurological conditions that are associated with specific patterns of neural degeneration (such as Parkinson’s disease or Alzheimer’s disease) disorders of consciousness are caused by many different types of injury and little is known about the key brain areas that are responsible for these deficits. Understanding how the brain functions after severe injury will help us to improve the accuracy of diagnosis and to estimate prognosis (the likelihood of recovery) more precisely. 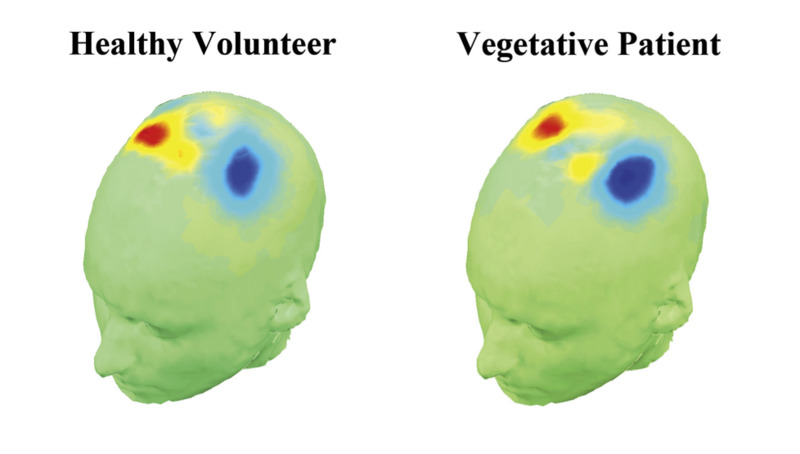 For example, we know that vegetative patients who show brain responses in certain brain scan tasks are more likely to improve than those who fail to show any response. We are pursuing this further and trying to define clear functional and structural factors that can help us to understand whether a particular patient will recover or remain in a vegetative state permanently. Electroencephalography (EEG) is a technique that uses sensors placed on the scalp to measure brain activity. Each sensor measures changes in the brain’s electrical activity in response to a variety of stimuli, including verbal instructions (e.g. “imagine clenching your fist”, “imaging kicking a ball”, etc. ), and passive stimuli, such as listening to sounds and words without being asked to do anything. EEG is widely used in clinical applications; however, the systems that we use are research-dedicated with a different set-up and tests (The Lancet 2011, PLOS One 2012). While neither setup is commercially available, our 4-channel EEG system is more readily available and is a first step to a portable system that would potentially allow some of these patients to communicate in the future. How do you decide when to use fMRI and when to use EEG? Ideally, we like to try both methods in all of our patients. However, in practical terms, this may not always be feasible. fMRI, for example, requires patients and families to travel to London, Ontario for the scanning sessions. MRI scanners are not portable; furthermore, not all MRI scanners are set up for the research that we do and each facility needs to go through a strict Research Ethics process. As we work at Western University, that is where our protocols are approved and that is where we have our experimental setup ready for our research. EEG equipment, on the other hand, is portable, and we’ll typically visit the patient at their home or local care facility to do this type of assessment. We are very proud of our ‘EEJeep’ – a fully equipped Jeep, which we use to go out on the road visiting patients and families in their homes, care homes, and hospitals. Aside from a patient’s proximity to our scanning facilities, several other factors may limit our ability to conduct an fMRI exam on any particular patient; for example, if the patient has some kinds of metal surgical implants, is unable to lay completely horizontal in the scanner, or is known to have certain types of seizures and/or spasms. In every case, we work closely with families to tailor our imaging methods to each patient’s individual needs. We aim to strike an ideal balance between using convenient imaging methods and acquiring the most accurate information possible, all while maintaining the highest standards of patient safety. How do we identify this type of brain response in patients? For patients who are unable to display behavioural responses to instructions, such as “raise your arm in the air,” we ask them to imagine particular activities, which generate predictable brain activation associated with a deliberate, conscious response. We ask patients to imagine certain activities that we know are associated with activity in specific regions of the brain. 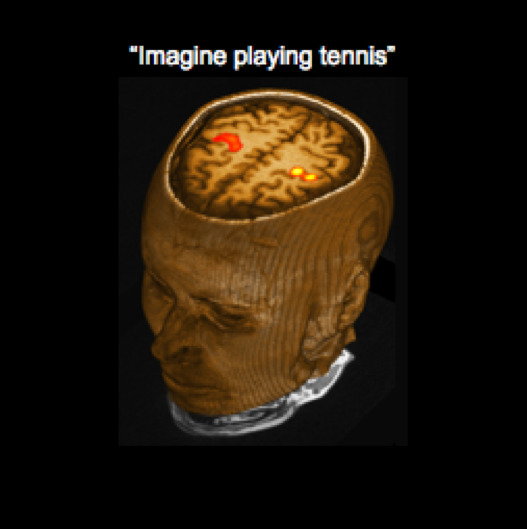 Specifically, in our fMRI studies we ask patients to imagine playing tennis or navigating around their house (as described in our 2006 Science paper). In EEG studies, we ask patients to imagine clenching their fist or wiggling their toes (as described in our paper in The Lancet in 2011). These imagery tasks have been used to establish a simple form of yes/no communication with a few of our patients. This is done by asking them to imagine one activity (e.g. playing tennis) if the answer they wish to convey is ‘yes’ and a different activity (e.g. navigating around their house) if the answer they wish to convey is ‘no’. This yes/no communication was described in our 2010 New England Journal of Medicine paper; in that case, a patient used this method to correctly answer 5 biographical questions. What clinical uses do you see for your research in the future? First of all, we think this research may have a substantial impact on the accuracy of the diagnosis after brain injury (New England Journal of Medicine 2010, The Lancet 2011). In some cases, we can show that there is a higher level of awareness than can be deduced based on standard clinical examination alone. The additional information we provide through neuroimaging is therefore very important because, in some cases, it may influence a patient’s diagnostic status. Providing physicians with the necessary tools to get the diagnosis right is the most important objective of our research. Second, these neuroimaging techniques may soon be used to provide a more precise prognosis. Currently, patient outcome after acute brain injury is very uncertain. For example, the precise reasons why some patients recover well while others do not is poorly understood. We have preliminary evidence showing that the more responsive a patient appears to be in the fMRI scanner, the more likely they are to have some signs of recovery (see our paper in Brain 2009), when tested again later. We are currently working to try to refine these techniques further in order to better predict who will recover and who will not. Finally, the end goal of this research is to develop a true brain-computer interface or a type of communication tool that will allow some of these patients to actually communicate on a routine basis (Annals of Neurology 2012, Journal of Neuroscience 2013). The basis for such a system might be the yes/no communication described in the some of our papers (New England Journal of Medicine 2010). However, that is still some years away, but it is something we are working very hard to get to.